WHAT IS A BIOMED TECHNICIAN? "Biomed Technicians" or "BMETs" are the technicians who repair, calibrate and maintain all kinds of medical devices, from infusion pumps to Surgical Equipment and Digital Imaging devices. 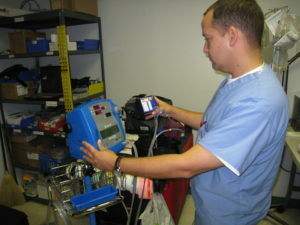 It is a job with a lot of responsibility, as patient's lives depend on these devices working properly. The Biomedical Field is also known as "Clinical Engineering", "Biomed" and most recently, as "HTM" (Healthcare Technology Management). WHAT KIND OF EDUCATION DO I NEED TO BECOME A BIOMED TECHNICIAN? Normally you'll need at least technical training in a specialized technical college ("Junior College") or Biomed training through the Military. Many technicians start by taking a basic course in electronics, and then specializing in medical equipment repair. Also, many Universities offer Associate Degrees and / or Bachelor's Degrees in Biomedical Engineering Technology. To be an effective BMET, Physiology classes are needed in order to understand how the medical devices interact with the human body. DO YOU HAVE TO BECOME CERTIFIED IN ORDER TO WORK AS A BMET? Certification is not mandatory, but getting certified as a CBET (Certified Biomedical Equipment Technician) opens many doors in the field. Visit the AAMI website for more details. Our publications cover all the details you need to know about what the Biomedical Field entails.